Please log in if you already a member of the programme. It’s not a diet, it’s a healthy way of eating that you will enjoy for life. It’s is easy to follow. It’s an interactive programme so you will get personalised help and encouragement every step of the way. It’s based on eating delicious natural food that has a low glycaemic load. 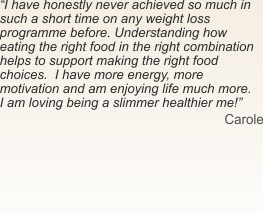 It’s not a faddy diet, it doesn’t involve starvation or deprivation and it’s totally enjoyable! There’s a huge choice of yummy recipes and easy to follow menu plans. We focus on stress management and include weekly relaxation sessions for you to download. 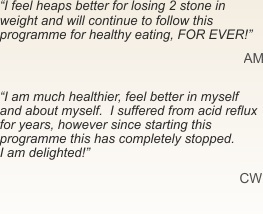 Whether you want to lose weight or just improve your health, this is the programme for you. Eating in this way can improve your heart health, reduce stress, improve digestion, boost energy levels and help you to feel and look 10 years younger! The best part - it only costs £7 per week – that’s just £1 per day. Are you ready to make simple changes that will create lasting health and vitality?